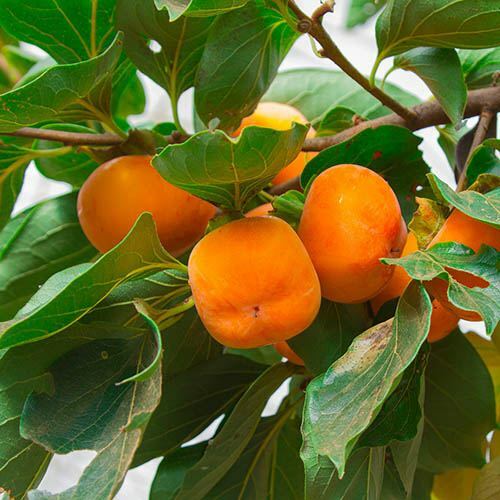 Grow your own exotic Sharon Fruits, also known as Persimmon right here at home. Self fertile, hardy and easy to grow in the Uk surprisingly. Wonderful foliage. Lustrous in summer and radiant in autumn. Supplied as 1M tall pot grown tree, dormant in Winter (no leaves). Grow sumptious sweet Sharon Fruit - also known as Chinese Persimmon - in your own garden. These exotic trees are surprisingly hardy in the UK - even young trees will survive to -10C and when mature will withstand much more. Trees are self fertile making them easy to cultivate.The foliage alone justifies a space in the garden with large lustrous glossy leaves through summer which change to a glorious coppery plum colour in autumn. The fruits ripen in September and are sweet, juicy and ready to eat as they turn deep orange. Unpicked, they hold on the tree and are gloriously colourful even after leaf fall. Grow in a sunny spot away from wall as Sharon fruit like plenty of air movement around them. A large free standing pot is ideal and the tree will reach a height of around 5-6ft. Treat yourself to this really special and unusual tree!